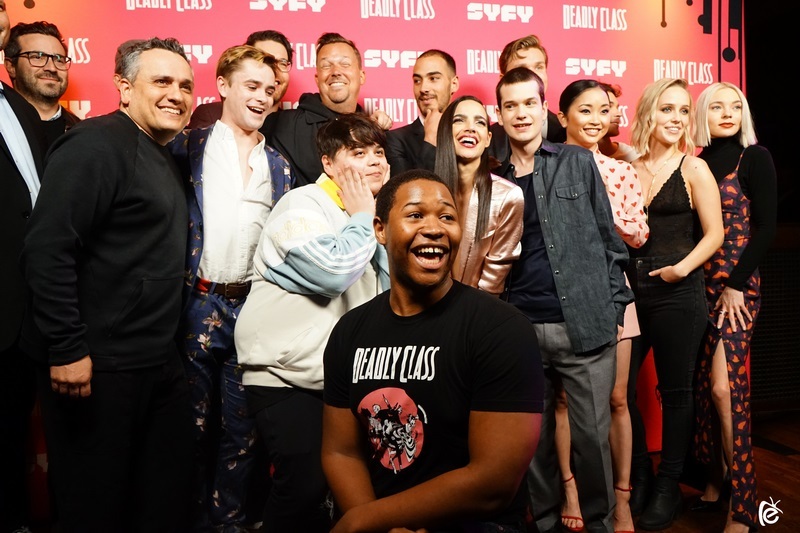 Last night, the anticipated new Syfy series “Deadly Class” held its world premiere in Los Angeles. Executive Produced by the acclaimed Russo Brothers (“Avengers: Endgame”) and based on the Image graphic novel by Rick Remender, “Deadly Class” follows a group of misfit teenagers trained to be assassins at the underground academy, King’s Dominion. Run by the sinister Master Lin (Benedict Wong), the school has housed many famous killers throughout the years, including Lee Harvey Oswald. The series begins with Marcus Lopez Arguello (Benjamin Wadsworth), a troubled orphan teenager who is recruited into King’s Dominion after being found living on the streets by Saya (Lana Condor), Willie (Luke Tennie), Billy (Liam James), and Maria (Maria Gabriela de Faria); four members of King’s Dominion who see the potential in Marcus after discovering his dark past. Having been orphaned after his parents were killed in a tragic accident, Marcus was sent to live in an orphanage where the head of the house and his roommates continually abused him to the point of him burning the orphanage and everyone in it to the ground. The first episode showed quite a bit of promise, with the chemistry of the young cast feeling completely natural and unforced. Benedict Wong, who previously worked with the Russo’s in “Avengers: Infinity War”, also shines in his role as Master Lin. Master Lin initially appears as a calm, father-like figure to the students, but it is quickly established that he can be just as ruthless. The script and production design are also completely solid, as is the direction by Lee Toland Krieger. If the pilot is any indicator, “Deadly Class” is sure to be one hell of a violent, action-filled thrill ride.